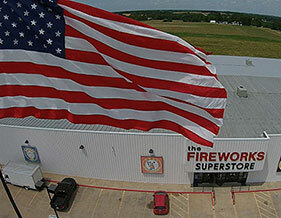 Shop America’s largest fireworks selection, The Fireworks Superstore in Hannibal, Missouri! 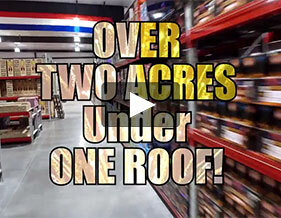 You’ll find all the biggest and best fireworks for sale at our 105,000 sq. ft., climate controlled facility. Every hot item and each huge blast will deliver a thrill. We are known for the best and lowest price fireworks. We are direct importers and we buy for less meaning you buy for less, too! Get serious about affordable, high-quality artillery shells, missiles, fountains, firecrackers, and more with a visit to our year-round showroom. Shop recognizable brands including Black Cat, Dominator, Megabanger, Shogun, Winda, Brothers, and many more. The Fireworks Superstore has something to offer enthusiasts of all ages. Really light up the night sky when you pick from the best fireworks on the market right here in Hannibal. Open daily 10 am to 6 pm.